Urlacher’s training camp is over. Can he make it through a 16 game season? Urlacher said that he’ll do everything he can to return in time for the season opener in a little less than four weeks, but there are reasons to be concerned. Although it’s not uncommon for a team to not push a veteran player coming off injury in OTAs, there is now reason to wonder why Urlacher was said to still be rehabbing the MCL/PCL sprain he suffered in January. Urlacher has said he didn’t have post-season surgery, but it is unusual for a player to still be rehabbing ligament sprains allowed to heal non-surgically 4-6 months after the injury. 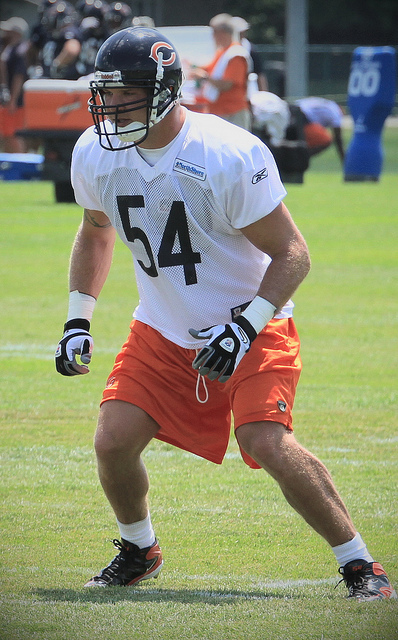 It’s also worrisome that Urlacher’s knee flared up within a week of returning to the field this preseason. The procedure is being called a debridement, which suggests cartilage concerns are behind this latest problem rather than lingering issues from the ligament strains. Urlacher’s comment that it’s something he’ll have to deal with all season long further suggest that this procedure may be an attempt to nurse his knee through the season rather than something more definitive. Urlacher’s history of playing through injury makes it likely that he’ll suit up as often as he can, but there’s reason to be concerned that he may be unable to finish the season. If he cannot, it’s a huge loss for a front seven who will then have to depend on Nick Roach inside and Geno Hayes on the strong side. When the preseason began, the Redskins surprised many by listing Evan Royster ahead of Roy Helu on the depth chart at running back and it was generally expected that Helu would work his way back into the starting lineup quickly. That’s unlikely to happen after reports that Helu is again suffering from Achilles tendinitis in his left foot. Helu wouldn’t give reporters a timetable for his return. He’s not evading the question. Helu’s tendinitis is likely, as with others like LaRon Landry and Jonathan Stewart in recent seasons, an overuse condition. A steady diet of rest and anti-inflammatories may help, but it’s impossible to say how quickly he’ll return or how likely a recurrence will be when he returns. Helu denied that this latest injury represents a pattern of leg injuries to reporters, but his explanation that these issues aren’t related because their on opposite sides of his body isn’t necessarily accurate. It’s certainly possible that this episode of tendinitis is related to his spring hamstring injury – it fits the classic cascade injury cycle that often happens when an athlete subconsciously tries to compensate for the injured area. Nicks continues to meet his rehabilitation goals as the Giants activated him from the PUP list a little over 11 weeks after surgery to stabilize a metatarsal fracture. The next two weeks will be a critical time for Nicks, as he tries to avoid any setbacks at the fracture site or muscle strains as he re-conditions his body in pads during live action. If he successfully navigates these next couple of weeks without issue, there’s only a small chance of a related injury early in the season. Moore, who has struggled with a hamstring injury for most of the 2012 offseason, was deactivated for last night’s preseason game and it’s highly unlikely he’ll be ready for the Raiders’ second preseason game Friday night. We’ll have a good idea of where Moore stands by this time next week. After presumably re-injuring his hamstring shortly after gaining clearance to practice two weeks ago, it will be a serious concern if Moore isn’t ready to return three weeks into camp. Athletes who aggravate a previous muscle injury often have a more severe strain. If Moore misses a third week with this aggravation, it’s time to wonder if his injury could need 4-8 weeks of rehabilitation. With Rod Streater and Juron Criner adding to a surprisingly deep wide receiver group, the team might decide to give Moore the benefit of the doubt of an extended rehab period. The impressive start from the rookie receivers may also push Moore to return before he’s fully recovered and risk another aggravation. Like Nicks, Moore’s first two weeks back on the practice field should be monitored closely. The timetable for Angerer’s return from a broken foot has been set at six weeks, but that might be an optimistic expectation. The Colts didn’t release any specific information about Angerer’s injury and I wasn’t able to pick up anything from the television broadcast, but there was a concerning vibe from the Colts’ locker room after the game and it seems that Angerer’s diagnosis was confirmed by MRI (after likely having an x-ray in the locker room). I’m clearly speculating here, but there are many foot fractures and associated conditions that can take longer than six weeks to heal – see Hakeem Nicks among others. A six week recovery would put Angerer’s return between Week 2 and 3 of the regular season. With the Colts’ bye week coming in Week 4, don’t be surprised if Angerer isn’t back until Week 5 or later, which would give him at least another two weeks of rehabilitation time. The Colts have said that they’ll open Angerer’s starting spot up for competition but keep an eye on former CFL standout Jerrell Freeman. Freeman has impressed in camp and was already running with the first team nickel defense (ahead of Kavell Conner) in the first preseason game.